A lot of blogs are created each day over the internet and if you want to have a chance to reach success, your site needs to differentiate from the others. You do not have a second chance to make a great first impression, and a beautiful dress will help you a lot. The same principle is applied to a website : you need good graphics! Of course the beauty of your blog must be reflected in the excellent content, otherwise you will have wasted the opportunity to gain a devoted reader. You can choose to invest somewhat around few thousand of dollars to hire a web design agency and get unique graphics, or decide for the alternative way, and build the site yourself with WordPress (saving a lot of money). You may want to start with a free theme, but the smart choice is opting right away for a professional and premium WordPress theme. InkThemes is a great choice if you want to get a responsive, easy to use and simple to set up professional theme for your WordPress blog. There are 47 different themes you can choose from. You can also request a test in order to verify the best theme for you (the trial mode is a unique option from InkThemes). From the many available, I liked their “BlogsTrend” theme, which is suitable for different niches, like technology, food, fashion, travel or a personal development blog. With this theme, you have many colors available to select from and the beautiful slider at the top of homepage enriches the user experience. There are two different menus, one for your pages and the other for your categories. Below the main slider, there are displayed the blog posts with thumbnails. In the sidebar you can place the popular articles, or the advertisements. The footer area can host up to four widgets, with easy social icons option. At the end, there are many styling options and custom widgets. In a nutshell, BlogsTrend is a great choice for your nice blog. All the themes have some important core features. Each theme is simple to install with just one click. You may build your niche blog or your business site in a handful of minutes. It’s very easy to set up and personalization does not require technical skills. With so many visitors coming from mobile devices, it is imperative that you install a responsive theme on your site. InkThemes are completely mobile responsive, which means they adapt themselves to a visit coming from a smartphone or from desktop. This way, you will increase the user experience! Whether you are going to build a technology blog, or a travel site or a place for your business company, InkThemes has the solution for you. There are many themes available you can choose from. You can select one single theme and pay for it. With just 59$ you have the option to install it on different domains. With this unique payment, you will get online support, video guides, future updates and photoshop images. Or if you need multiple themes, with $147 you can purchase everyone (there will be 1 new theme every month). The biggest package is valued $247 : you will receive all the themes and the plugins in the store. Normally you won’t need any support, as you will be able to tweak the theme and personalize your site without any technical skill. But if you need any kind of help, there is a customer support available for your requests. If I could go back when I started my online blogging career, I would have chosen a professional theme right away for my first site. It may sound a difficult task for any inexperienced people, but with some efforts you will start with the right foot. Having a good looking and professional theme is very important to ensure your visitors won’t hit the back button right away. InkThemes is a great choice for your brand new site or for upgrading your old theme to a new professional and good looking one. What’s the theme you are using on your site? The guys behind InkThemes are great. I have yet to try the themes there but certainly something to consider real soon. I think a theme being responsive is important. Nowadays, websites need to look good on mobile, tablets and desktops. If they don’t look good, you are going to lose A LOT of traffic (at least from me). They created some nice themes there, Reginald. Having a mobile responsive site is incredibily important nowadays! 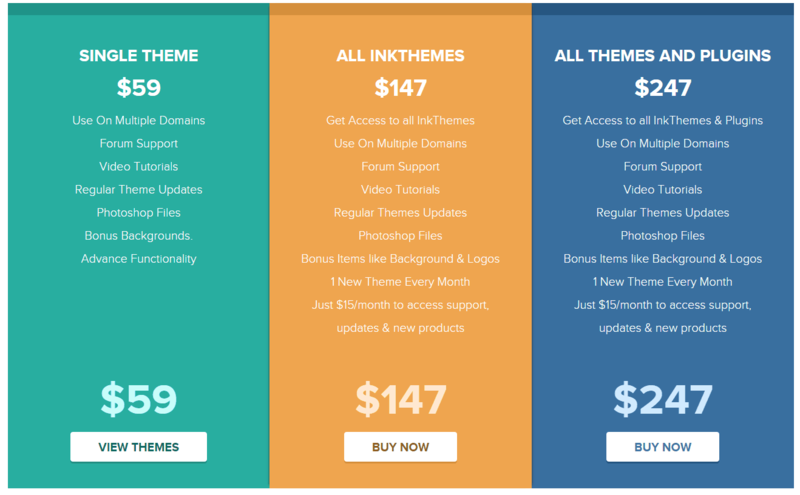 Really, Ink themes deal in completely top notch quality wordpress themes. I am using them on my 1-2 blogs and found them very stunning. great to hear your positive feedback on InkThemes. Thanks for your feedback, Emebu! Great review of these responsive designs. I am currently working on getting my website redesigned to be more friendly with mobile devices. It seems they have really been on the ball in the wordpress community. I just wish there were this many people doing the same thing for vbulletin. Finding a good responsive forum design is almost impossible without paying someone to do an expensive custom design. I know they will come eventually, but sometimes I get impatient when it comes to my websites. Having a mobile responsive and HTML 5 design is very important, nowadays. Most of all, for professional and business ownwers. Thanks for commenting, good luck with your new one. Thanks. Last night I got all of the mobile version of the videos ready and working on a test page. They look really beautiful on the iPhone and iPad. Before you could not see any videos at all on the main website home page at all. I Just need to test the fallback .flv on some older windows browsers today. If all goes good I could hopefully make that one page live tonight or tomorrow. This is big for me because I would say a good 40% are mobile users. I will keep you posted. And thank you. I think that mobile users will increase in its number. Hence, you are preparing your site for being mobile responsive, that’s great! I can’t wait to hear from you the URL and how it goes. Sure you can check it out if you want. The responsiveness of the website is not done yet, but I am one step closer. All of the videos on the front page are now in html5 with a fallback of flash if a browser doesn’t support it. There are some videos on the inside of the website that I plan to convert this weekend. Once those are done I will try to go about converting the all of it. Let me know what you think so far. I think it looks beautiful on my iPad. How are the videos working on your side? Do you know of any way to test this thing on older IE browsers if I have a Mac? Bootcamp is the only thing I can think of and I am afraid I won’t be able to find windows versions old enough. I figured there would be some kind of website or app for that. I tried to post the link here but it said I have too many links even though there is none. But you can find it linked to my name up there. that link is working fine both on mobile and desktop. Just checked with my pc and my iPad. I always prefer to use MTS and Themeforest themes but after this review, I will give a try on InkThemes too. Thanks for sharing your experience and checking this post, Ravijit.